53rd day of the year. There were then 312 days left in 2019.
on the 8th week of 2019 (using US standard week number calculation). 64th day of Winter. There were 26 days left till Spring. I want to be 14 again so I can ruin my life differently. I have new ideas. 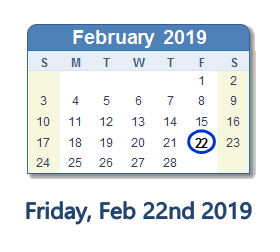 What happened on February 22nd 2019?